These days, any organization that wants to either do business, or stay in business, has to have an online presence. A website is crucial if a company’s going to connect with both existing and potential customers and they need to make sure that their web pages tell their clients everything they need to know about the company’s products and services. However, des pite that, the company can’t include too much information, especially on the home page, the place where people will first encounter them. Readers of web copy typically scan the page very quickly, rather than actually reading every single word. Consequently, it’s vital that a company has the right words, and enough of them, to grab and hold the visitor’s attention. Although it’s important to include as much information about the company as possible in order to entice the reader, the copy also has to be easy to read. Killer headlines and text broken up into manageable chunks will make web pages easy on the eye. There are no hard and fast rules, but as a guideline, headings should be eight words or less, sentences up to a maximum of twenty words, paragraphs no more than seventy words, with a total page count of around two hundred and fifty words. In the online world less is nearly always more. Hiring a professional copywriter to compose content for a website involves not merely displaying the company’s brochure online but creating an online brochure. At first glance this might appear to be the same process but there are fundamental differences. Many organizations make the mistake of simply putting their brochure online when they have a website created. After all, they already have all the information aimed at potential customers in printed form, so why not put it all online? The details are already in existence and have worked perfectly well so far, so why not just use the same text on the website? Surely it’s the same thing, isn’t it? The truth is, a company can’t simply put its brochures online, because writing for the internet is very different to writing for traditional printed materials, whether they’re brochures, catalogues or even direct mail pieces. Any organization only has seconds to grab and hold someone’s attention on the web, since people typically scan text very quickly. Website pages have to be created with the impatient reader in mind. The writing of website copy is a specialized area, since the pages must provide all the relevant information, yet not get bogged down with too many details. Well-written, yet concise, text can also help improve a company’s ranking with search engines, which could make all the difference between success and failure. Featuring all the details from official brochures on the newly created web pages may simply encourage people to dismiss the company and its products in a matter of seconds, especially if the home page appears to be overloaded with text. Potential clients will always appreciate being able to locate what they’re looking for quickly and easily. They’ll be able to do this if a company’s pages are well written and organized properly, and that translates into good customer service. This is where the experienced copywriter comes in. Hiring a professional to compose the content is one of the most important decisions an organization can make when planning or improving its website. 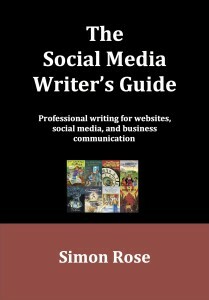 The Social Media Writer’s Guide is available as an ebook and as a paperback on Amazon, Kobo, Barnes and Noble, iBooks, Smashwords and many other locations.